“From dough roller to decoy maker” sound likes a career change at the opposite ends of the spectrum. “Not so,” says Jeannie Vincenti, Pat Vincenti’s wife and partner in the 17-year-old decoy business based in their home in Churchville, Maryland. “Each takes a creative talent, and the making of fine decoys, as was the producing of fine bakery items, is a wonderful output for Pat’s artistic talent.” And many decoy enthusiasts must agree, as his output of Upper Chesapeake Bay style decoys simply cannot keep up with customer demands. This year the Havre de Grace Decoy Museum, located along the shoreline of Maryland’s famed Susquehanna Flats, will honor Pat Vincenti as the Honorary Chairman of the 22nd anniversary Havre de Grace Decoy Show held the first weekend of May. Pat follows in the footsteps of some Havre de Grace legends, such as Madison Mitchell, Paul Gibson, Jim Pierce and Bill Collins, all former chairmen who had an impact on Vincenti’s decoy making career. Although Pat’s a bit uneasy with the recognition, those associated with the museum are delighted. Not only are they recognizing the quality of his decoys, they’re rewarding him for his Herculean efforts towards the success of the museum. Born in 1954, this native son grew up along the town’s waterfront, across from the present-day Susquehanna Lock-house Museum. Some of his childhood friends, whose parents worked, fished and hunted on the surrounding waters of the Chesapeake Bay and Susquehanna River, turned out to be present-day decoy makers, as did he. While in high school Pat became active hunting the waters that fronted his community. Most of his schoolmates were the sons of local watermen, so they introduced him to the waterfowling techniques – blind shooting, bushwhacking and body booting – that had been handed down through generations of their families. Part of the group successfully petitioned the City Council for permission to build a duck blind off Park Island. They also gunned the sand bar off Tyding’s Point, located within the legal limit of the Flats. But it was body booting he preferred, a gunning technique that he practiced well into his adulthood. Pat made decoys in high school with a savvy woodshop teacher who knew how to select projects to command a boy’s attention. This was where “I first learned to make frames (silhouette v-boards) that could be used for body booting,” Pat says. With Pat’s love of hunting and his need for decoys, he ended up in Madison Mitchell’s shop, but soon learned that he couldn’t afford to purchase a rig. Mitchell, who had previously helped him on a high school project, encouraged Pat to make his own. But other than his woodshop projects, he lacked the necessary experience. Jim Pierce, who was now established as a local decoy maker, offered Pat a chance to “help out” in his decoy shop, working around his schedule at the bakery. This gave Pat the opportunity to observe and learn first hand the process of making a gunning decoy. 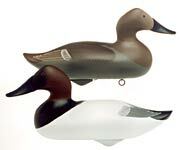 Under Pierce’s tutelage, Vincenti developed the skills to make and assemble decoys. In 1974, now experienced, Pat returned to Mitchell’s shop as a part time employee. The pay was the same as at Pierce’s shop - gunning decoys. Mitchell nicknamed him “Blue Monday,” as Monday was the typical baker’s day off and he always showed up to work. Pat continued to help Pierce in the evenings until 1986 and worked from time to time for Paul Gibson as well. In 1975 Vincenti began making his own decoys, turning the bodies in the evenings at Mitchell’s and Gibson’s shops, then finishing them at home with a draw knife and spoke shave. Ed Sampson, who carved heads for many Upper Bay decoy makers, made them for Pat, and Clarence “Titbird” Bauer, who also worked for Mitchell, painted and helped assemble the birds. Pat was not only able to fill his personal decoy rig, he was soon selling to area hunters. In 1978 Pat built his first decoy shop, then supplanted that a year later with a much larger one when he and his wife purchased their new home in Churchville. 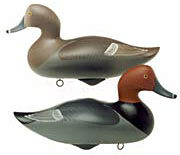 By 1982 collectors began buying his decoys to fill out their shelves. So in the fall of 1986 Pat left the bakery to make decoys full time. The family still had the stability of his wife’s job and she helped in the evenings priming decoys and painting the heads. That fall Pat greeted Mitchell at his doorstop; he had heard that Pat had quit his day job to make decoys full time. He still chuckles at Mitchell’s comments: “Blue Monday, have you lost your mind? You have a family to support.” But Mitchell must have been pleased with what he saw as he started sending orders his way. In 1987 Pat was selected as a featured carver in Southern Living magazine’s, “By Southern Hands,” a book by Jan Arnow featuring southern American artisans’ creations that included split oak baskets, dolls, musical instruments, pottery, walking canes and decoys. The Smithsonian’s Renwick Gallery, who saw the book, invited Vincenti to display there and discuss his art form of decoy making. That same year the Maryland chapter of Ducks Unlimited commissioned Pat to make 50 wigeon decoys for use in their fundraising efforts. Pat began working as a volunteer at the Havre de Grace Decoy Museum not long after it opened in 1986. One of his first projects was the restoration of Madison Mitchell’s decoy shop that had been moved to the museum grounds. During the renovations Pat stored the contents of the shop at his home, and with the help of donations and fund-raisers the project was successfully completed. A Vincenti wood duck was raffled as part of one fund-raiser and sold for $700. Good things were happening to the Vincenti’s as they watched their cottage industry grow. In 1990 noted Maryland artist Louis Frisino won the West Virginia waterfowl stamp competition. The painting featured black ducks flying over a rowboat that was occupied by an attentive black lab and a pair of Vincenti’s black duck decoys. In the spring of 1994 the Vincenti’s opened a retail store in nearby Havre de Grace to sell paints and carving supplies, contemporary decoys by Pat as well as other carvers and a large selection of old gunning decoys. Pat, an enthusiastic collector of old birds, particularly canvasbacks of the Susquehanna Flats, is well versed in the history of Upper Bay decoys. Not only is he able to identify the makers, he can often provide additional historical background as to where the decoy was used and by whom. His store has become a magnet for locals looking to dispose of their fathers’ and grandfathers’ decoys. Jeannie manages the store and their two daughters, who could talk ducks and run the register, initially assisted in the family venture. Pat’s local attention was soon conveyed to a national stage later that year. A front page headline in a local paper, the Register, read” “Local Decoy Carver says Good Morning America.” ABC anchors Charlie Gibson and Joan Lunden and a Good Morning America crew of 40 showed up at the Vincenti’s Churchville home to tape a segment for their nationally televised show as part of their Great Chesapeake Bay Bus Tour. The segment featured Pat’s decoys in various stages of completion and interviewed him concerning the techniques and uniqueness of his craft. Jeannie treated the GMA crew to a Chesapeake Bay style buffet. Pat’s volunteer efforts include his position at the Havre de Grace Decoy Museum, where he was elected as a board member seven years ago. Last October he was elected as the Museum President, an office he will hold for a two-year period. Pat’s solid-bodied birds, like his mentors’ decoys, are lathe turned one at a time, usually out of cedar, pine or basswood, then shaped with a draw blade, spoke shave and a knife. The basswood heads are cut out with a band saw and finished by hand. Once assembled and sanded, paint is applied in the same manner and patterns as Mitchell, Pierce, Gibson and Collins, as have most Upper Bay makers for well over 100 years. But “Vincenti’s paint is far superior to anybody else,” says Collins. 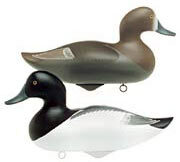 “For a production decoy, it’s the best around.” Canvasbacks and black ducks are the favorite choice of Vincenti collectors. Some knowledgeable collectors feel that Pat is the best of the current generation of Havre de Grace decoy makers, clearly at the head of the class. His love of area waterfowling history, his knowledge of earlier makers and their decoys, and his straight talk as a dealer in the trade combine to provide a positive experience for both veteran and novice collectors of Upper Bay birds. Most people, especially the current generation of Havre de Grace decoy makers, would certainly agree.